OTTAWA, ONTARIO--(Marketwired - Dec. 1, 2014) - Focus Graphite Inc. (TSX VENTURE:FMS) (OTCQX:FCSMF) (FRANKFURT:FKC) ("Focus" or the "Company") is pleased to announce the completion and filing of an Environmental and Social Impact Assessment ("ESIA") for the Lac Knife Project located in northeastern Québec. Golder Associates completed the study and the report. This significant milestone is one of several initiatives underway that are contributing to the ongoing process of de-risking Lac Knife's Project development. A Feasibility Study that demonstrates the technical and economical viability of the Lac Knife project was filed on August 8th, 2014. Since then, the general site layout of the Feasibility Study was further optimized between July and October. This optimized site layout is included in the ESIA report and is being used to consult with communities including the Uashat mak Mani-Utenam ("ITUM") First Nation and community stakeholders in Fermont with respect to their sustainable development interests. The mine site layout and design will be refined further during the upcoming detailed engineering phase of the project. The ESIA is the main document used to communicate and discuss details of the project to all concerned regulators and community stakeholders regarding the project's impact, risk mitigation, and potential benefits. The Lac Knife ESIA was filed with Québec's provincial authorities at the Ministère du Développement Durable, de l'Environnement et de la Lutte contre les Changements Climatiques ("MDDELCC"). The Company is working in collaboration with MDDELCC regarding the various permits required for developing the Lac Knife Project and this process will continue towards the objective of obtaining the final Decree from the government of Québec. Don Baxter, President and Chief Operating Officer of Focus Graphite said: "We are very pleased to announce this significant milestone that furthers our sustainable development initiatives by integrating both social and environmental aspects of the Lac Knife project. This report is the result of several years of fieldwork and consultation with stakeholder communities in the area, and is an ongoing initiative. The Project team that we have assembled continues to deliver important milestones that continue to advance and de-risk the project. It is worth noting that this relatively low cost flake graphite mining project also has a very small carbon footprint compared to other graphite projects outside Quebec due to Hydro Québec's hydroelectric power that is a key economic and environmental variable for the project." 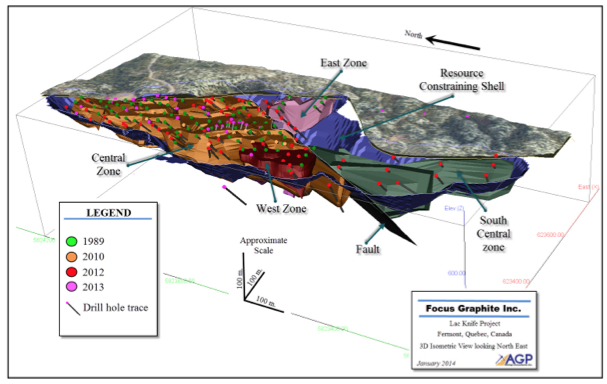 Worthy of mention is that the Lac Knife battery ready graphite project is a relatively small-scale mining operation with a relatively small footprint in a well-established mining district. Following the Company's news release on May 27th titled "Independent Test: Focus Graphite Succeeds in Producing Extremely High-Performing Coated Spherical Graphite For Lithium Ion Batteries", a Preliminary Economic Assessment of this second transformation into spherical graphite is planned. This study regarding value added products is not within the scope of the current Lac Knife project but it is now an integral part of the process for obtaining a mining lease. The Lac Knife concentrate would be further processed in a separate commercial scale production facility to manufacture spherical graphite. Therefore, participation in this project offers the potential added value of this second transformation to spherical graphite used in Li-ion batteries that will help to enable the electrification of transportation and other green technologies as well as creating more jobs in the secondary transformation sector. These are key interests with respect to the Plan Nord in Québec. Both the mine site and the spherical graphite production plant would be powered by Hydro Québec's low cost and low carbon footprint sustainable energy sources. Neither the capital expenditures or operational costs nor the potentially higher margins associated with the second transformation of graphite concentrate into spherical graphite products are included in Lac Knife's current project economics. The positive Feasibility Study for the Lac Knife Project covers a 25 year mine life based on 7.86 million tonnes (429,000 tonnes Proven and 7,428,000 tonnes Probable) of Proven and Probable Reserves grading 15.13%Cg. The project has the potential to become a low cost high quality battery ready graphite producer with an internal rate of return of 30.1% before-tax (24.1 after-tax) based on an average value of $1,713 per tonne of high carbon content concentrate (base case). The payback period is estimated at 3 years.